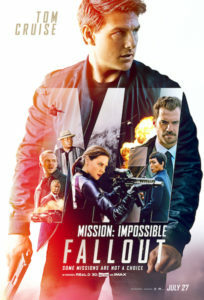 The “Mission Impossible” film series launched in 1996 produced by and starring Tom Cruise at age 33 brought Cruise’s action skills to the forefront. In “Fallout,” 2018, the sixth film in the series, Cruise now age 56, continues to astound as an action hero. Age has its advantage here—as you can’t help but commend his perseverance in continuing to not only perform most of his own stunts, (at his age), but he continues to ‘raise the action bar’—regardless of your feelings toward Cruise as an individual his astonishing action skills can’t be ignored. Cruise has also made some smart choices in casting by continuing with screenwriter and director Christopher McQuarrie, of the prior film “Rogue Nation,” as well as expanding the female roles by adding more characters. Actress Rebecca Ferguson (Ilsa Faust), a former MI6 agent who has her own agenda at times shares the lead with Cruise. Bringing back (Michelle Monaghan) Ethan Hunt’s wife and resolving that storyline; gives us Ethan’s soft side, while visually showing us he’s human. Another brilliant move is the addition of Angela Bassett (Erika Sloane), as the tough as nails CIA Director as she brings a different type of attitude to the character; she is ultra strong in her position with no hesitation in questioning the MIF on their motives and actions. Both female characters Erika Sloane and Ilsa Faust are timely in leveling the action genre playing field by providing intelligent, powerful and strong women roles—I applaud this move. To be frank, adding Jeremy Renner as a side-kick in the prior films was a good move in sharing Cruise’s spotlight, however; “Fallout’s” character changes are decisively a greater mix. Casting a bearded Henry Cavill a CIA Operative Assassin (August Walker) best known as (Superman/Clark Kent 2013, 2016, 2017) ultimately provides a deeper appreciation for Ethan Hunt also works well. Aside from the character changes, the visual effects and stunt work is another reason the film is such a standout. I’ve learned a new acronym HALO (High Altitude Low Opening) referring to helicopter jumping— special military operatives have used it in order to go as secretly as possible into an area. In “Fallout” Tom Cruise completed over 100 HALO jumps to get the right sequence. The stunts are reminiscent of the “Fast and Furious” series at times particularly with the ‘Tokyo drifting’ car chases, and has the nonstop intense action feel of “Mad Max.” It distinctly retains its own identity with it’s star, (Cruise), Ethan Hunt’s hyper speed running, motorcycle stunts and HALO jumps. Most have seen the trailer of the battling helicopters; I can honestly say, “You ain’t seen nothing yet, as the conclusion of that scene alone is worth the price of admission.” Another thrilling adrenaline scene is the rooftop building jumps as in a Mario Bros. video game. Similar in concept, except MIF team partner Benji Dunn (Simon Peg) controls Hunt’s moves via remote communication, as to the direction; right or left turns, leaping straight on from one building to another building or jumping down a few stories. The result creates hysterical banter between the pair all while the audience is clinching deeper into their armrests with intermittent sighs of relief as the moves land. The plot centers on a group called the Apostles with the goal to create chaos employing suffering and death. It appears they’ve been scheming with an insider named John Lark to obtain plutonium to create three dirty bombs. Hunt’s boss Alan Hundley (Alec Baldwin) sends him to Paris to locate John Lark before he’s able to buy the plutonium. He’s also given an unwanted sidekick, August Walker. Here’s where the action starts to ante up, with motorcycle chases, Hunt running full speed, building leaps and plenty of martial arts hand to hand combat fighting. After Paris, the film shifts to London, with the finale in Kashmir Valley in India at the base of the Himalayan Mountains. The ending has three different storylines running simultaneously with razor-sharp precision, all nail-biting till the end. The last 45 minutes contain some of the best action sequences to date. They are thrilling, intense and entertaining. It also appears that filmmakers have a message they’d like you to take away from the film. Here’s a line from the narrative regarding Ethan Hunt, “We need people like you that care about the life of just one as they do millions.” I sense Hunt being called a hero without specifically saying the word; another character said to Hunt, “I sleep soundly at night knowing you’re here.” My take away—I appreciated the addition of the strong female roles, the exhilarating action scenes along with the film’s implication—that all lives matter.